My Danish identification card (“sundhedskort”) was physically damaged, and I would like to get a new one. I went to the local municipality office not more than 500 meters away. I stood and waited for perhaps a quarter of an hour until I found out the I could order the Sundhedskort on the Internet on borger.dk. So after queueing up for so long I went home and went on borger.dk, where one is suppose to login with the central Danish login system NemID. borger.dk transfer the site to nemlog-in.dk where my Ubuntu Firefox just halts! The java-based NemID at one point was loading my computer with 200%, – later just 100% and then yet again on 200%. The unresponsive interface did not allow entering the id and password information. Even if I shut down Firefox. Even if I rebooted the computer! Recently, a single Dane managed to stop all other Danes from using NemID for several hours, that is, citizen required to contact the municipalities, regions or the state by means of the Internet were not able to do that. As Danish banks are also using NemID nation-wide banking was also in trouble. Banks have apparently a backup system, allowing people to login by other means than NemID. The single Dane had used an of-the-shelve DDoS program with the attack reportedly costing around 10 Dollars. I am writing ten Dollars or 7 Euros. I am not talking thousands or millions, just plain 10 dollars. The NemID is a utter embarrashment for the Danish society. The Danish government is pushing its citizen to use Internet-based services for services. When NemID is out of order much of the Denmark is going to a halt. My situation now is that with a reboot, several “kills” og Firefox and a Java process on Ubuntu I am not able to login: to the official municipality web-site, to my banking. I imaging that must be due to incompetent Java programming. And did I mention there is no phone number you can call. The nearest thing is an online form. You can fill in a complaint in the very small form field “besked” and then wait. They report two days waiting time! Interestingly the NemID provides an easy way for organizations to avoid responsibility: If I am to login to borger.dk I am not actually using borger.dk, but NemID, so if I have a borger.dk login problem, borger.dk can easily say that it is not their problem. NemID which has little responsibility for actually services the individual citizen with a problem, is not interested in doing a good service for the login-user as the login-user is not, from their point of view, a customer. For the fun I called the phone number displayed at borger.dk: 1881, pressed 4, heard music, then some useless information and at time 2:43 I got in contact with a borger.dk supporter. He seemed surprisingly helpful, but could (of course) not help me. But he was able to let my call go further on to NemID, so at time 6:00 I heard music again, and at 9:00 a supported appeared at the other end of the connection. I cut off the connection 11:49 after he informed me that neither Linux nor Ubuntu is supported and there there is no way to complain about this. This is Danish digital service in the year 2013: It doesn’t work and there is nothing to do about it. For those who read Danish will find amble critique of NemID at, e.g., the IT professional site version2.dk. Politicians seem indifferent. The recent DDoSes (there have been multiple) have caused a bit of concern. In the end lets try “$ rm -r /tmp/icedteaplugin-fnielsen/” and login again. This allows me to login alright. I see that my “Sundhedskort” is reported to be issued 18 August 2008, obviously an error as the card has been valid from 1 April 2003. The “Sundhedskort” should now appear in my physical mailbox within a forthnight. This is the state of Denmark. This entry was posted in society and tagged nemid. 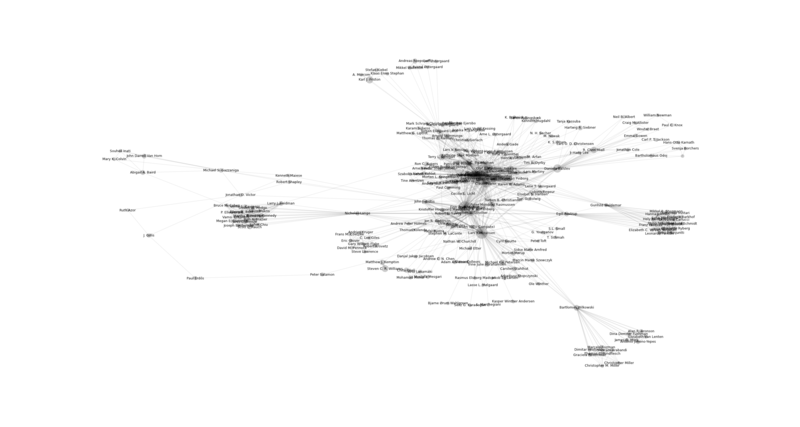 Graph of co-authors from data in the Brede Wiki. Only the authors with a Paul Erdős-number less than 5 are shown. Paul Erdős is in the lower left corner; Karl J. Friston at the top with Erdős-number 4. Interestingly John J. Sidtis has an Erdős-number on 3 from two independent paths. I am/was a bit suspicious about Mr. “J. Gilles”. I cannot find much information about him. I got this path from the Erdős–Bacon number article on Wikipedia which leads to Jonathan D. Victor’s page. I suppose Professor Victor knows his coauthors, so there shouldn’t be a problem. J. Gilles is according to Victor “Joseph Gilles”. One Internet page states “During the war Gillis made a significant contribution to code breaking at Bletchley Park” (http://www.jameshamiltonphysicist.com/5-inst-and-queens/). Possibly the same person. This entry was posted in science and tagged Brede Wiki, network analysis, network visualization, networkx.